The Shēngxiào (生肖) also know as the Chinese Zodiac in the west. It is a methodical plan of future actions for each year, relating to an animal and its attributes, revolving around a 12 years cycle. There are variations of a famous legend explaining how the twelve animals were chosen, to represent each of the twelve years, in a cycle. Here is the story. 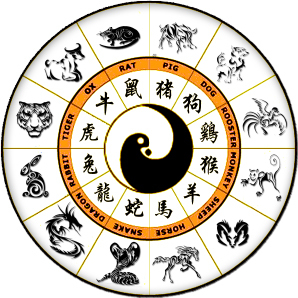 The Jade Emperor had the enormous task of choosing an animal, to represent each of the chinese zodiac year and in what order of ranking each chosen animal should be placed. After sleepless nights and endless head scratching, he decided to organise a race across the mightiness river in the whole of China. The twelve animals will be chosen and will be ranked in order of their finishing position, in the race. With the idea fresh in his mind, the Jade Emperor quickly dispatched words out, informing all the animals in the kingdom, to prepare for a race of their lives. The next morning the cat was the first animal to arrive at the start of the race. His best friend the rat was the second to arrive, knowing they were useless at swimming they decided to enlist the help of the mighty ox. The ox was a fine young gentleman, so he happily agreed to transport the friends across the rapid river. As the crowd gathered to watch the epic race for glory, the rest of the animals arrived at the river bank readying for the start of the race. In total thirteen animals have arrived for the race, the cat, rat, ox, dog, snake, monkey, tiger, rooster, rabbit, sheep, horse and the almighty dragon. With his indomitable strength and relentless endurance, the dragon was odds on favourite to win the race, to become the leader of the chinese zodiac. The Jade Emperor fires the starter gun, signalling the start of the epic race. As the animals set off for the race of their lives, the rat pushed the cat into the river and he had to be rescued by the coast guards. With the rat on board, the ox powered through the field and quickly overtook the fierce tiger, even the almighty dragon was no match against the raw power of the ox. He continued powering through the field pass the rabbit, pass the snake and finally pass the horse. By the start of the last straight to the finish line, the ox was in a commanding lead. Just as he was about to cross the finish line, the rat cunningly jumped off the ox's back and pass the finish line in first place. The rat became the first animal to represent the first year of the Shēngxiào with the ox second. The tiger managed to claw his way back to third place after a dismal start, in fourth place was the agile rabbit who hopped from stone to stone, the almighty dragon only managed fifth place as he had to stop, to make rain. The snake hid in the horse's hoof and jumped ahead of the horse into sixth place with the horse finished in seventh. Eighth, ninth and tenth goes to the sheep, monkey and the rooster as they crossed the river on a home-made raft. The dog only finished in eleventh because he was late for the race, as he wanted to shampoo his fur, to make it shine in the sun. The lazy pig finished last in twelfth place because he fell asleep, on the river bank. The cat didn't even finish the race as he was too angry with the rat and from then on all rats became the mortal enemy of the cats.